Good ideas are just like a The fleeting meteors in the sky how can we catch it and make it comes to real world? 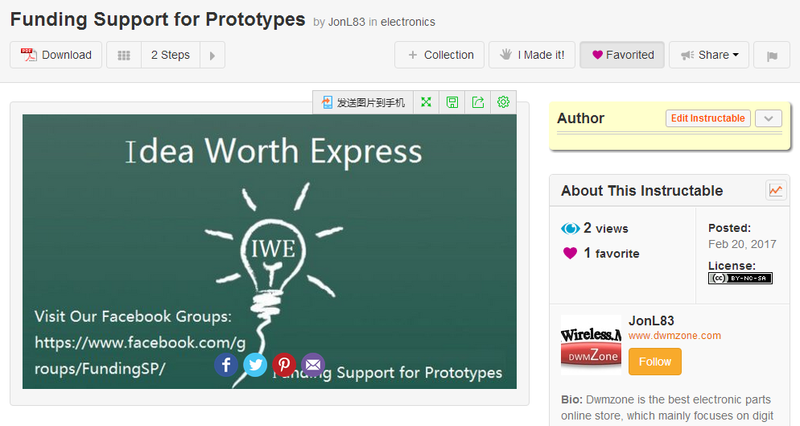 Idea worth express.Funding Support for Prototypes Service target the electronic world.If you have a good idea just let us know we will help you to design and make it comes to truth only if we also think it’s good or you can approve it’s good,If you already have finished a design just let us know we can help you to make prototype for free only if we think it can get people educated or bring the benefit to people’s life or work. Our team set at the City Shenzhen,Guangdong,China where has the largest electronics market which name is HUAQIANGBEI You can find anything electronic parts here within five minutes at a small counter which spread over the market.Here it also has a full mature supply chain,we can gurantee that we can offer an professional,Experienced and fast service. We are going to fully use the social network media to get further exposure to our service. 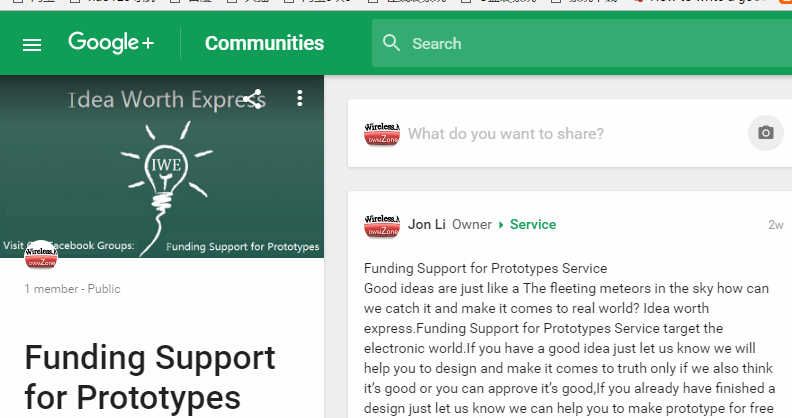 Funding Support for Prototypes Group at Facebook, Funding Support for Prototypes at the communities of google+, instructables project.We have online store which is Dwmzone whih will help to sell the prototypes.we have a Venture capital team who is going to funding for the prototypes,We have a experienced engineers team who is going to offer a profesional consultant service for the coming ideas and design.We also have has a supply chain manager team who is going to gurantee a fast manufacture and delivery service. Let me explain the whole process simply. Lessors own the ideas and designs Dwmzone will rent the ideas or designs In a certain period of time(one or three years) after that the Dwmzone will release the ownership back to the Lessors. 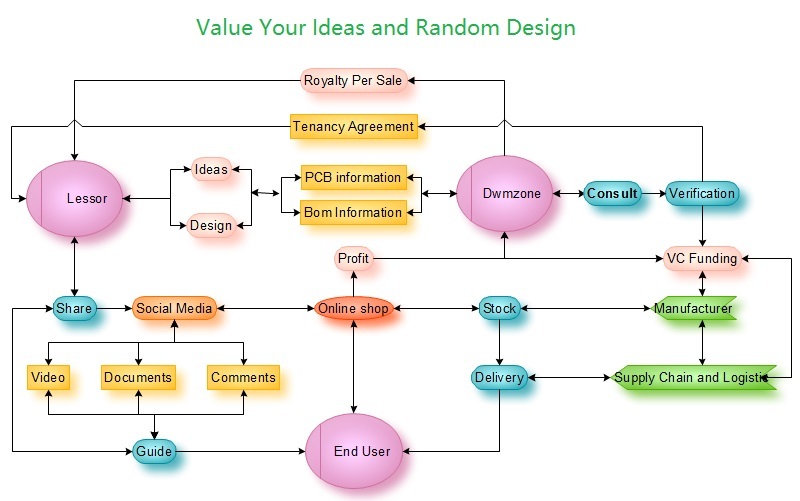 Turn the ideas and design into a Required PCB information and Required Bom information send to Dwmzone.Share the software to the End Users and Shoot a video give an introduction about the design and ideas and guide the End Users how to use it.reply the comments and answer the questions. Give lessors a professional consultancy make it more practicable and turn the ideas and design to a real products,Sign a Tenancy agreement with Lessors which will write down the lease period and Percentage for paid royalty (we will pay you a percentage-based royalty per product sold), Offer a vc funding and charge the manufacture ,stock,delivery and sell around the word. Pay for the service, got the benefit and fun. This entry was posted in Service and tagged arduino, DIY, funding support, Open soure, PCB Service on February 21, 2017 by Ameisina. The E931.96 accepts data from the MCU on the SERIN input pin. Measurement data is clocked out and motion interrupts are flagged on the INT/DOCI pin of the device.A zero to one transition on the INT output indicates detected motion. The interrupt pin will stay at one until it is cleared by the MCU.The MCU can read the ADC voltages (14 bits) and the configuration data (25bits) through the DOCI output of the E931.96. The DOCI pin is used to transfer data from the device to the MCU. 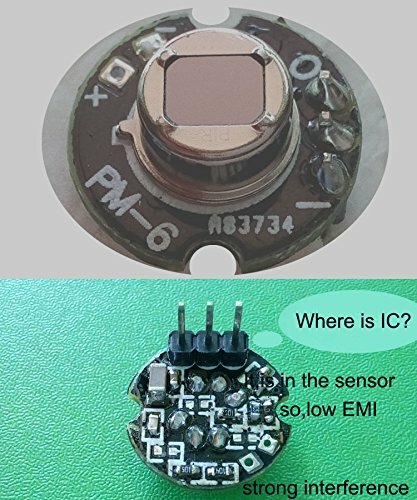 The MCU drives a clock signal and the E931.96 provides the data bit. 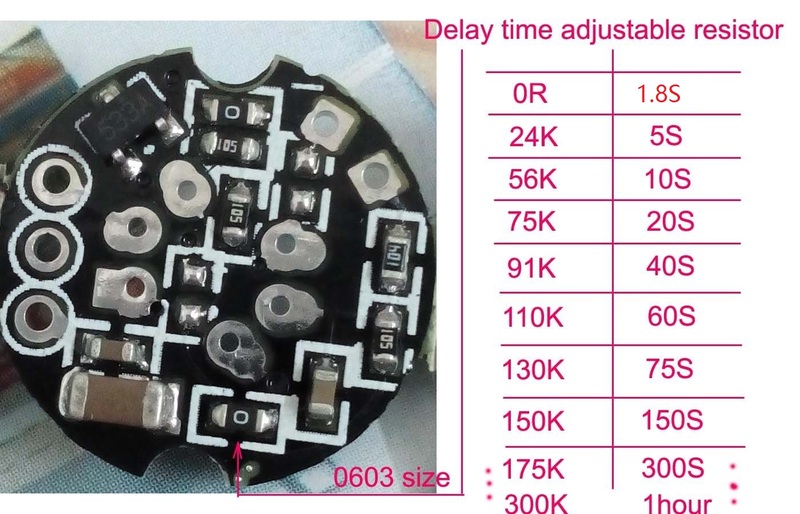 The MCU initiates reading of the status and configuration data by forcing a high level for the duration of more than 2 device clock cycles (>3/FCLK) on the DOCI pin (tFR in the datasheet). A clock pulse is generated by a low to high transition on the DOCI pin. Subsequently the MCU samples data bit value driven by the E931.96. This process is repeated 15 times to read the ADC value and a further 25 times until all the data bits are clocked out of the E931.96. 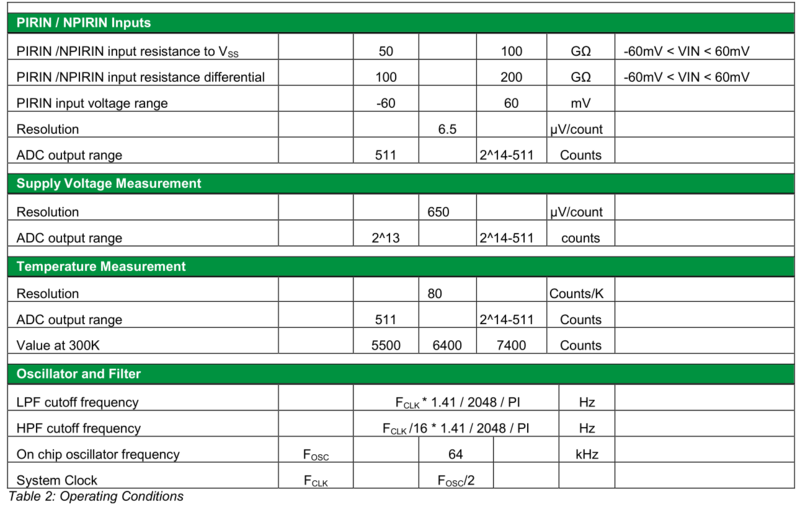 The sampling speed is influenced by the capacitance on the DOCI line due to the PCB layout and the MCU load. The DOIC pin does not have a strong driver so that it can be overdriven for the clock pulses. When readout is completed, the MCU must drive the DOCI pin to zero, and subsequently switch to tri-state in order to receive a new interrupt. The source for the ADC input can be selected between PIR input, supply voltage input and temperature. Reading can be terminated at any time by forcing the DOCI line to zero for at least 4 system clock cycles.The interrupt source for the DOCI/INT output can be selected between reading of the ADC values or for motion detection. If the ADC interrupt is selected, an interrupt is produced every 512 system clocks that signals that an ADC value is available to be clocked out. It is possible to read ADC values without making use of the interrupts generated by the E931.96.For interrupts as a result of motion, the motion detection bit and the interrupt source bit need to be set.No interrupt will be generated while the microcontroller accesses the interface.Below is an example of reading the ADC value as well as the configuration data from the device. In the examples above we made use of small functions that is shown below. The syntax of these functions may be different to suit the particular compiler that is used. The DOCI output is clocked by the device as fast as possible; the direction handling is also taken care of. After an interrupt was generated by the device, it is cleared by the MCU by driving the DOIC pin low and releasing it, so that the device can drive again when an interrupt occurs. The function below generates the clock signal on the SERIN input of the device. The clock delay can be as short as one cycle on the MCU. 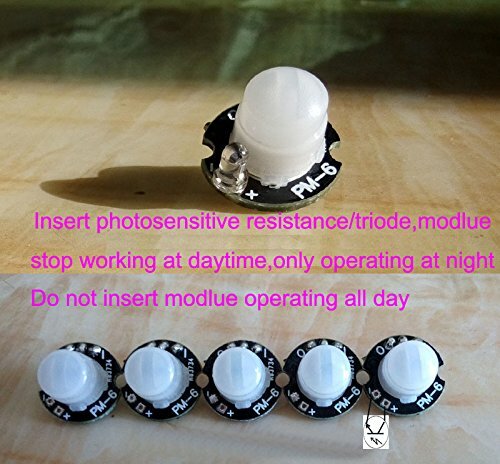 This entry was posted in Application and tagged PIR, PIR module, PIR sensor on February 6, 2017 by Ameisina. detected. Motion is signaled through the push-pull output (INT). The criteria for motion detection are programmable and can be changed by the external controller. differential input. The PIR signal is converted to a 14 bit digital value on chip.All signal processing is performed digitally.The E931.96 is available in a SOIC-8 package. The multiplexer selects the source signal for the ADC. It can select between the differential PIR inputs, differential temperature sensor output and asymmetrical supply voltage divider. The integrated voltage regulator provides a regulated 2.2V supply for an externally connected conventional PIR detector. The regulator can be activated through the control register. 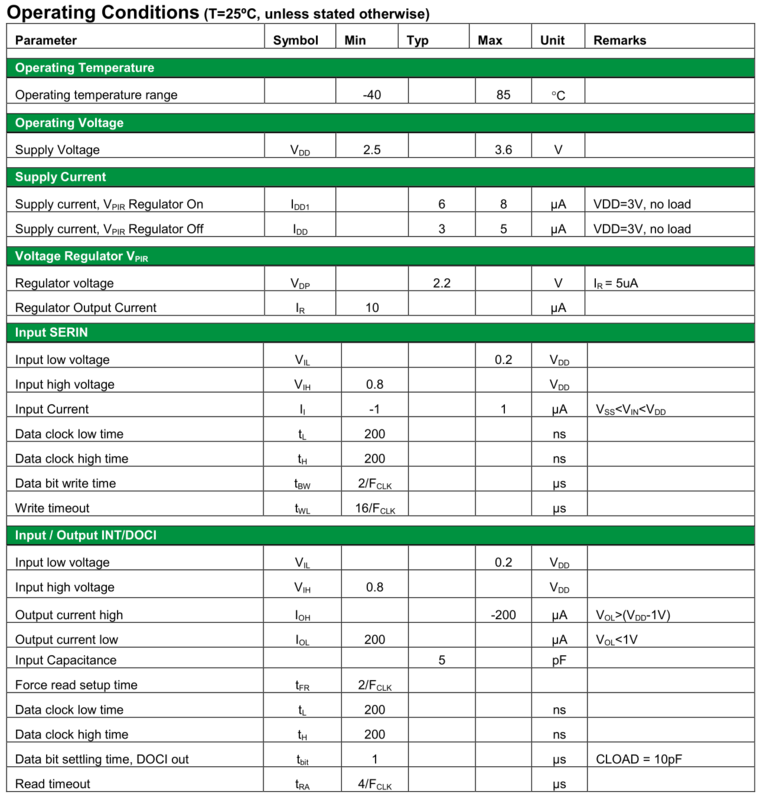 The bandgap voltage reference provides constant reference currents and voltages to the analog circuitry on chip across the specified operating temperature range of the device. In addition, it contains a temperature voltage generator (temperature sensor). The IC contains an on chip low power oscillator. The frequency is set to 64kHz. The timing signals and cutoff frequencies of the digital filters are derived from this frequency. A 2nd order low-pass filter with a cut-off frequency of 7Hz eliminates unwanted higher frequency components. This signal is then passed to a 2 nd order high pass filter with a 0.4Hz cut-off frequency. Both filter output are accessible through the serial interface. The signal from the band pass filter is rectified. When the signal level exceeds the sensitivity threshold, an internal pulse is generated. Subsequent pulses are counted, whenever the signals changes sign and exceeds the threshold again. The conditions for an alarm event such as the amount of pulses as well as the time window in which the pulses occur are programmable. 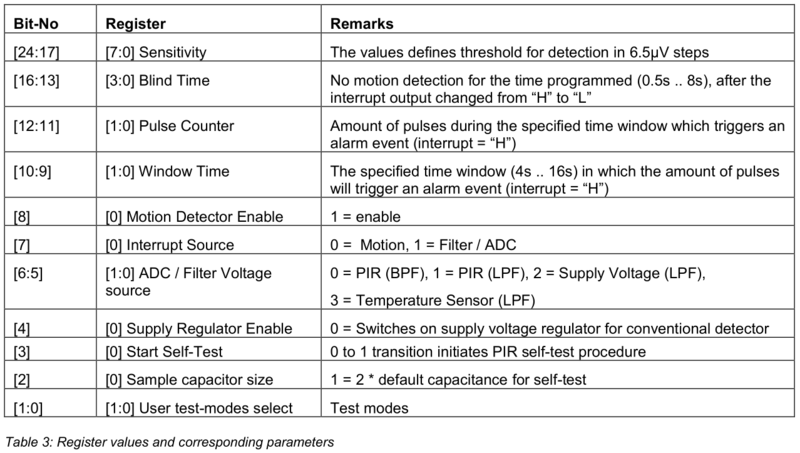 If an alarm event is cleared by resetting the interrupt output (by the device or through the external MCU), any motion detection is stopped during the programmable blind time. This feature is important to prevent self-triggering in applications, where high detection sensitivity is required. The device setup is done by programming setup registers via the SERIN pin. A simple clocked data-in protocol is used.Information from the device is read out with the INT/DOCI pin. A similar clocked data-out protocol is used. The device contains a configuration register. Write access is through the serial input. Read access is performed through the interrupt output. The Interrupt can be switched off by setting the mask bit to Motion and switching off the motion detector function. For Motion Detector Mode, ‘0’ or ‘1’ has to be selected. Supply a regulated 2.2V on the V REG output. Initiates PIR self-test procedure that takes 2seconds to complete. The configuration data is transferred into the device via the serial input. The external microcontroller has to generate a zero to one transition on the SERIN input and subsequently apply the data bit value (0/1). The ‘zero’ and ‘one’ time for the transition can be very short (1 instruction cycle of the microcontroller). The data bit value must be applied for at least 2 system clocks (t bit ) of the E931.96A. Whenever the transfer of data bits is interrupted for a period greater than 16 system clocks (t R ), the last data received is latched into the configuration register. The transmission of a 25 bit data should not be interrupted for more than 15 system clocks, as the device may latch the data already at this stage. The serial output serves as an Interrupt output, indicating motion and as a serial output for reading status and configuration data from the circuit. The E931.96 accepts readout with MCU defined timing. The MCU has to force DOCI to a high level for the duration of more than 2 device clock cycles (t FR ) and subsequently read out the data bits as described in the timing diagram below.Reading can be terminated at any time by forcing the DOCI line to “0” for at least 4 system clock cycles. The interrupt source for the DOCI / INTR output can be selected between the ADC and the motions detect logic. If the ADC is selected, an interrupt is produced every 512 system clocks. If not, the alarm event logic will set the interrupt, whenever it detects motion AND motion detection is activated. No interrupt will be generated while the microcontroller accesses the interface. The PIR voltage as well as all internal data can be read through the DOCI interface. The sequence of the data is fixed due to priority. 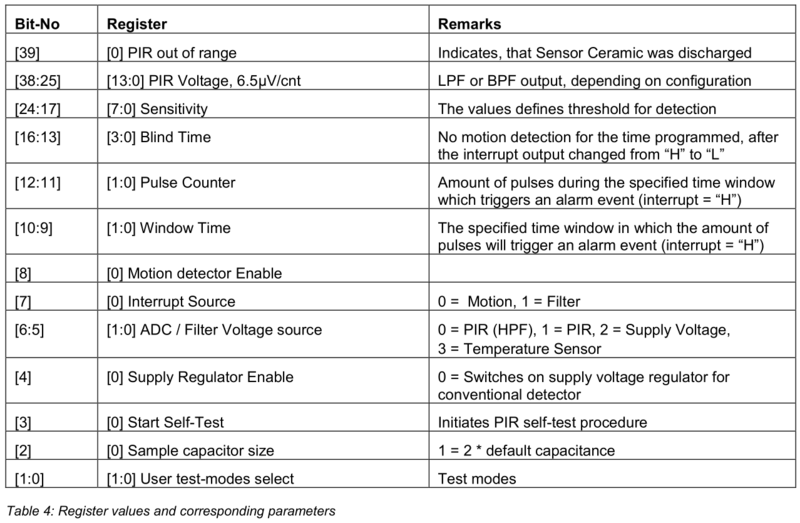 The device outputs the PIR voltage value first, followed by status and configuration information. It is not required to read all data. The ADC Source [6:5] has to be switched to the PIR inputs and the digital LPF output needs to be selected (=1). V PIR = (ADC_out – ADC_offset) * 6.5µV. The ADC Source [6:5] has to be switched to PIR input and the digital HPF output needs to be selected (=0). V PIR = ADC_out * 6.5µV. The ADC Source [6:5] has to be switched to Chip Supply (=2). V DD = (ADC_out – ADC_offset) * 650µV. The ADC Source [6:5] has to be switched to the temperature sensor (=3).